Nigel (or Neil in the USA) can’t understand why numbers are so important. But then he gets a magic watch for his birthday and WHIZZ! BANG! all the numbers in his world disappear. Nigel’s life is turned upside down—no way to score at football is only the least of it. Perhaps those pesky numbers are useful after all…. I was mathematically challenged as a child, failing all maths exams, although I’m perfectly fine with addition, subtraction, multiplication and long-division. I can even add up in my head! I took ‘O’ level and CSE at least four times, and was unsuccessful each time because I simply don’t understand algebra or equations. So when I was asked to write this book, I took it as a personal quest to get it right for Nigel/Neil. It seems to have worked, because I get masses of queries about this book each year from teachers wanting to get hold of a copy. It’s now sadly out-of-print, but rare copies can be found at AbeBooks and other secondhand bookstores online. Published by Dorling Kindersley 2000 and also in Italian and Japanese editions. 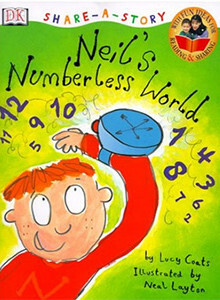 The US title is Neil’s Numberless World.